21" McGuffey Ana 1948 early hard plastic by Madame Alexander - The character of McGuffey Ana came from the hugley popular Electric Reader literary series of children's books. The Alexander Doll Company made a complete about-face from a long run with composition dolls to the new process of hard plastics. Alexander started their transition in 1947. The first dolls made of hard plastic had the look of composition that their costumer and retail buyers had become used to seeing. Alexander was all-in with this dramatic change of manufacturing and supported it within the doll industry and publically such as Playthings Magazine. This era of dolls was changing quickly with new technology not yet tested. Other manufactures rapidly followed this lead set by the Alexander Doll Company and sent the industry on a decade-long race and sometimes bitter competition for the "next big thing." McGuffey Ana was a popular character from the McGuffey Readers used in many schools from the 1830s to the mid 20th Century. One of Madame’s purposes for her dolls was to inspire a girl to read and explore. It is estimated that at least 120 million copies of McGuffey Readers were sold between 1836 and 1960. On this 1948 catalog page, the Alexander Dolls announces their introduction of hard plastic "The new All Plastic doll created by Madame Alexander surpass the old composition doll in strength, features and lightness." 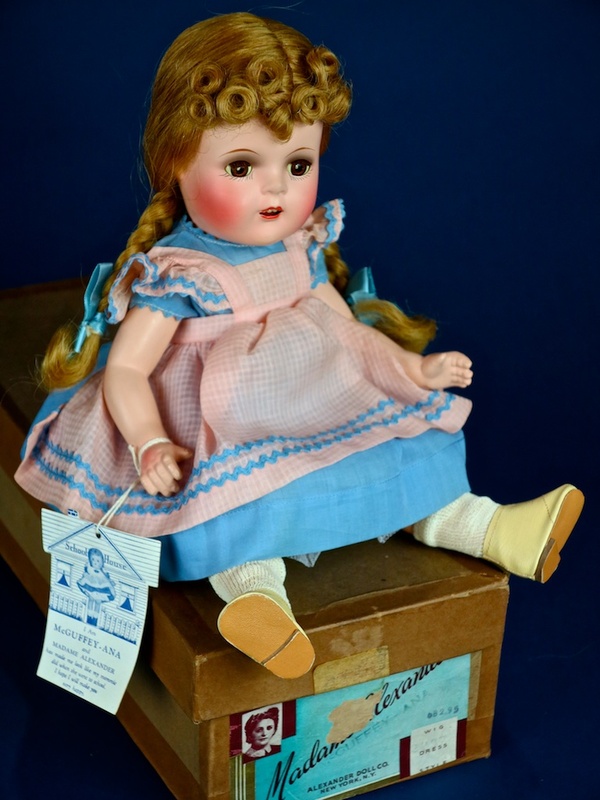 A few of the details of this charming doll are her McGuffey Ana hang tag, tagged dress, lace and pigtail ties. March 1939 Playthings Magazine for the Alexander Doll Company and their composition McGuffey Ana. Two of the best-known school books in the history of American education were the 18th century New England Primer and the 19th century, McGuffey Readers. McGuffey Ana Mint in Box 1937_14" - William Holmes McGuffey (September 23, 1800 – May 4, 1873) was a college professor president who is best known for writing the McGuffey Readers, the first widely used series of elementary school-level textbooks.